This conversation might be new to you, but it's always been relevant and ongoing, and it's often a reaction of something your people have caused. It's often complicated by outsider intrusion and historical erasure. This blog originally appeared on Indian Country Today Media Network. In the midst of the debate over Joseph Boyden's ethnic ambiguity, Konrad Yakabuski wrote a misguided Globe and Mail article in the author's defence originally titled "Joseph Boyden's lynching should set off alarm bells." I wasn't sure what was more surprising, Yakabuski's nearsightedness or that he seems willfully ignorant that First Nations' right to sovereign definitions on identity are an essential part to reconciliation. I'd like to address Yakabuski, and all the Yakabuskis out there, who should consider First Nations people, women especially, before they speak. I'd like to take Yakabuski out of his quaint, frolicking, necktie-wearing lifestyle, where he seems to pontificate over the aesthetics of downtown Toronto more than he ever contemplates missing and murdered Indigenous women, and ask him to step into the life of one of us. Did you know, Yakabuski, that my cousins were called "chugs" in high school? Never mind their parents' sobrieties or lifestyles; native kids were simply identified, without their consent, as "chugs." It's in reference to alcoholism and its assumed prevalence in our communities, as if white communities don't have a problem with substance abuse -- but never mind that. Did you know, Yakabuski, that I've been heckled and my First Nations friends have been sexually harassed when they take public transit in Vancouver? Men have asked me, "How much?" and it didn't matter if I was wearing a zipped-up hoodie, and it didn't matter when I was 12 years old, either. My Salish features are a detriment after a certain hour, on certain streets, in certain cities. I'm not telling you the worst. I will tell you about the taxi driver who sexually assaulted a friend going home. And that her inability to come forward with her story was directly related to her identity. 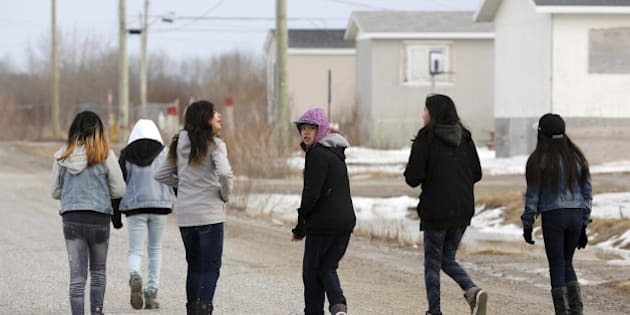 RCMP have approached young native women assuming they're prostitutes, and those women are sometimes accused of solicitation when they're simply waiting for their rides. When I was assaulted, I reported the crime against me, and the police did not make eye contact; the police questioned me as if I were the culprit of my own victimization. This is widespread across North America. This conversation might be new to you, but it's always been relevant and ongoing. Ah, Yakabuski, I'd also like to mention on my first day at junior high in Agassiz, B.C., I sat in the front row as my new teacher explained to his class that they should "tolerate" First Nations students. He said it with a smile, as if he was doing us a service. Teachers put some of my smartest friends in special education courses because of their rez vernaculars. I dropped out, mostly because I was maltreated and highly intelligent. There's more, but I'm resisting the urge to frame this as a melodrama. First Nations women's lives can be brutal, heartbreaking, and short-lived, and I am just trying to give you a glimpse. I'm sure you're familiar with the statistics, but I'm trying to give you something more. The reason why I'm glossing over a few experiences First Nations women have been subjected to is to lead into the very reasonable idea that our criticism of Boyden is based in the knowledge that it's insensitive of a man to assume an identity we can't escape -- an identity we carry on our backs, in our blood and hearts, an identity we die for -- an identity I am so proud to carry. It should shame you, and anyone like you, to think our criticisms aren't based in our sovereignty, a thing that is necessary for true reconciliation. It's not based in any new liberal rhetoric. This conversation might be new to you, but it's always been relevant and ongoing, and it's often a reaction of something your people have caused. It's often complicated by outsider intrusion and historical erasure. You wrote a piece on First Nations identity with a preface that stated your kind typically takes, "... pride in shunning all labels, attachments, causes and collectivisms." You know most Indigenous cultures are built on collectivism, right? Journalists know this kind of thing, right? Your implicit bias makes your contribution to this conversation a large zilch. I shudder to think Globe and Mail thought your insights were a contribution. No, not all First Nations women experience the very horrendous things I named, but collectively we care that it's happening to us. You should take a seat, and listen before you speak on us again. Collectively, we need to defend ourselves from people like you, who degrade our identities, politics, theories and criticisms. Collectively, we have engaged in a meaningful discourse on Boyden, which is not a "lynching" but mostly a proposition for Boyden to come in and publicly engage in a dialogue that could positively benefit people who are searching to reclaim a history erased by our own government. Collectively, there are too many beautiful things to name about the generosity our communities have given to Boyden and several other authors who are inspired by native history. You should take a seat and listen before you speak on us again.